I've been pleasantly surprised by the positive reaction my SXSW Sketchnotes have received this week. They've been featured on all sorts of sites, from Coudal Partners and Daring Fireball to Laughing Squid and The Guardian's Jemima Kiss' PDA Blog — and on Twitter! I'm fascinated at how quickly the sketchnotes spread across the net. On the Tweet scan and RSS searches for my name, "SXSW Sketchnotes" were popping up all over and being re-tweeted like crazy. I seeded the first few links to SXSW speakers and a few friends, but at a certain point the mentions took on a life of their own. People seem fascinated with personal accounts of events. Sharing a unique, personal perspective is a powerful way to communicate. Sketchnotes are one way that attendees to the panels can re-live an experience. Even those who never attended the event can glean ideas from this kind of text+visual note style. I'm finding that readers enjoy the human touch of my sketchnotes, which were hand-drawn in real time at the event. They're a little imperfect, yet very readable and understandable. Their impressionistic nature seems to be engaging readers in a different way than photos or computer-generated text from SXSW Interactive. For many SXSW attendees the sketchnotes seem to awaken positive memories, even several days later. This is one of the reasons I keep a travelogues when I go on trips. Notes and sketches of my activities help me recall clear memories — even years after the trip. 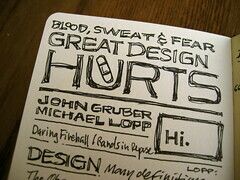 Hopefully this will be true of my SXSW Sketchnotes in the future. I've been approached several times this week about doing "sketchnote" style illustrations for a couple of projects. It appears that something unique, like my sketchnotes, can lead to new opportunities to do more of them. All of the sketchnote scans and photos have been uploaded to Flickr with a Creative Commons non-commercial, attribution license, which frees people to place my images on their sites with attribution, and no need to ask permission. I love this! In a nutshell, the SXSW Sketchnotes have been a phenomenal success. Both SXSW attendees and outside observers seem to resonate with them, and they tell one angle of the human experience I had while in Austin. I most certainly plan to do more sketchnotes as I attend conferences, based on the reception of these and other sketchnotes I've published. As I discover new effects from the sketchnotes, I'l be sure to add them here. I stumbled upon your blog and sketchnotes in one of my web walkabouts. There's something very poetic about visualizing information and turning it into design. I also appreciate that you've shared your insight into the response to your work, and what the implications are for blog communications. You've made a new fan.